January 16, 2014 | Lens cap....off! I forgot my SD card again. That’s twice now I’ve lugged my camera to work and back without it, and it’s two times too many. I need a spare card. It’s after 9, and I’ve got a quiet, dark house. 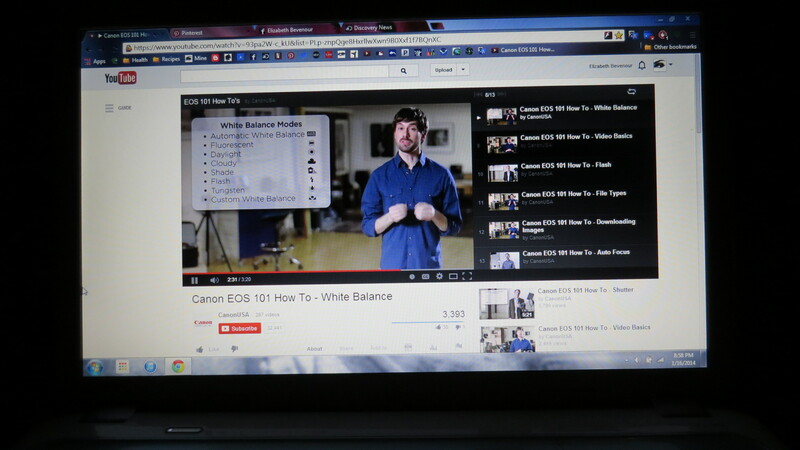 It’s time to review those Canon videos. I’m also putting night time photography on my road map. I’m surprised that the picture I took of my laptop came out as well as it did. I recall seeing pictures or video of tv shows looking weirdly distorted. I wonder if that’s technology being kind. I’m going to stop here and put my SD card back in my camera. 3 minute, 20 second videos are just my learning speed. Day 16, get it together.